This Mowat Note examines public infrastructure investment in Canada today. Canada has a historic opportunity to rebuild our 20th century nation-defining infrastructure for the 21st century. Capitalizing on this opportunity will require more money, a new governance framework, deployment of innovative financing tools, and consideration of a broader range of factors, such as climate change. A strong, competitive economy and high quality of life depend on public infrastructure. Strategic infrastructure investment underpins Canada’s long-term economic growth and prosperity, and ensures that our communities are livable and sustainable for generations. Modern Canada has been defined by the nation-building projects undertaken at the right place and time in our history. Since Confederation, far-sighted investments in highways and transit, the Canadian Pacific Railway, the St. Lawrence Seaway, and the electricity projects, pipelines, airports, seaports and canals that dot our landscape laid the foundation for our prosperity. It is now the time to renew our commitment to building Canada. The country’s aging infrastructure needs repair and refurbishment. New challenges from climate change, the internet of things and rapid urbanization require new national commitments to infrastructure development and integrated approaches to planning and delivery across sectors, departments and governments. The case is very clear, from the critical need to replace our aging sewer systems and waste water treatment facilities in the face of more extreme weather events, to the possibility of investing in new place-defining infrastructure for a 21st century Canada. Canadian governments at all levels understand the challenge and have started on plans to address Canada’s infrastructure needs. Earlier this year, the federal government provided details on its 10-year Building Canada Plan. Canada’s premiers will be discussing infrastructure priorities with ministers and stakeholders at a summit in Toronto this summer, and again at the Council of the Federation when it meets in Charlottetown this year. And while the national focus on Canada’s long-term infrastructure challenge is welcome, an important conversation is also needed about the best way to approach the issue. What mix of approaches to funding, financing, delivery, governance and coordination among different levels of government will achieve the greatest impact? The relationship of infrastructure to important public policy considerations that include congestion, productivity, the environment, climate change, human health, demographics, economic transformation, employment, digitization and community development. The opportunity to use different models and financing mechanisms to deliver infrastructure more efficiently and effectively, and that take advantage of the increased willingness and capacity of private sector and non-profit community partners to deliver on public infrastructure developments, including a willingness to assume risk and to share dividends with government. The need for intergovernmental arrangements and partnerships that establish clear shared priorities and have appropriate policy, funding, and delivery roles for federal, provincial and local governments. To take full advantage of the opportunity presented by a renewed commitment to significant infrastructure investment, governments will need an effective framework that reflects each of the above considerations. On the other hand, if we proceed with an ambitious round of infrastructure projects that are based on current models, we risk reinforcing the shortcomings of those approaches—shortcomings that have led to underinvestment, higher transaction and operational costs, and uncertainty about priorities. 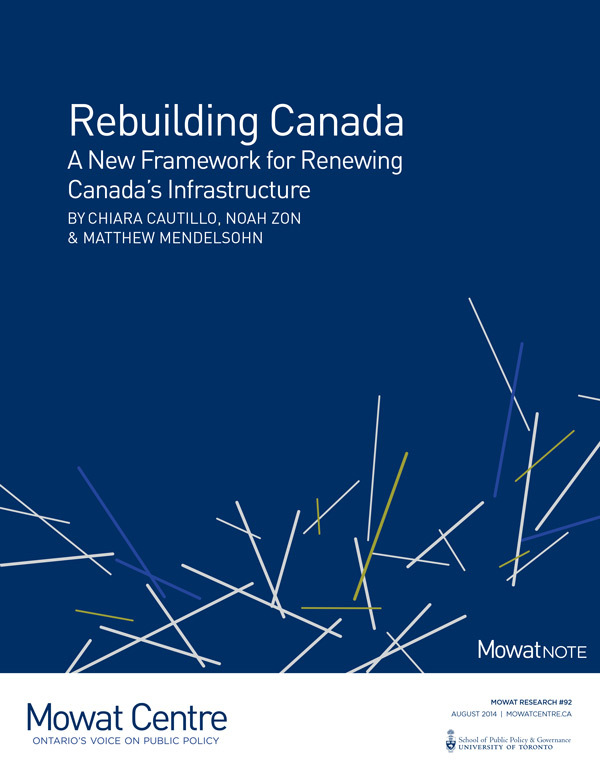 With this research note we hope to support policymakers in their ongoing discussions that will shape the next generation of infrastructure investments in Canada.